Meet your new favorite flying toy. 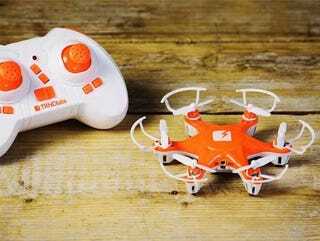 The SKEYE Hexa Drone features a unique six propeller design, giving you ultimate control for flying in every direction and pulling off ridiculous stunts. For a limited time, Jalopnik readers can pick one up for nearly 35% off MSRP - just $45, with free worldwide shipping. As the name suggests, the Hexa Drone features two more blades than the standard quadcopter, giving you added stability and control. It comes with three controller settings for beginners, intermediate, and advanced pilots, so you can work your way up to a pro in no time. It’s small enough for indoor flights, but has a 164-foot (50m) range so you can enjoy it outdoors, too. The SKEYE Hexa retails for $69, but for a limited time, Jalopnik readers can save nearly 35% and get it shipped worldwide for just $45. It makes for a fun, unique gift for all ages. Don’t miss out - this won’t last long.